Synopsis: An epic romance about the naive Irish girl Kate and her mysterious lover, whom she rejects and then spends her life seeking. Beside an African river, Kate realizes both her emotions and her passionate and consuming love for the man she rejected. The story becomes more mythic and timeless as Kate seeks her lover through heaven and earth, Eden and hell. Rejected in her turn, Kate waits in the dust outside the closed gates of heaven where her lover finds her, only to be rejected again though an ultimate sacrifice by him, they reach heaven, but Kate still has to accept his sacrifice and so find herself- a pearl. The novel, born in dreams, is interlaced with the eternity of love and the ambiguity between dreams and reality. Review: First of all l would like to say a big thank you to Ruth Finnegan for sending me her book and giving me the chance to read this story. I was sent this book in exchange for a honest review. I am so glad this book is on my bookshelf l would tell people that you should step outside your comfort zone with books because it is good to add more authors and genres to your reading portfolio even if you do not read books like this. I normally read books of this genre but l also stepped outside my comfort zone with authors and genres l am so glad l did because l have read so many great books. I highly recommend this book the author is nice and l would love to read more from this author. the author asked me to review her book on goodreads. A delightfully dreamlike,mystical tale of epic scope, spiritually and erotically changed - mike hanne university of Auckland. A long, entrancing tale shaped in a language woven with ancient imagery and rhythms, a magnificent riddle conjured up by a magical storyteller - itala vivan, university of Milan. 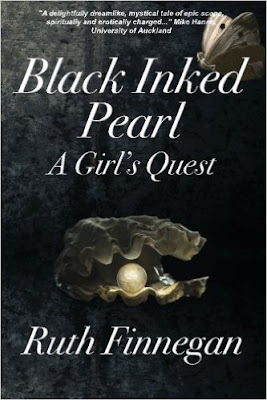 I really enjoyed reading this book l loved this story and the poetry and this took me four days to read and it is a great book and l got this book in paperback but it is available in hardback and Ebook l would rate this book more then 5 stars if l could. I would happily read this book again and again. when l was reading this book my kitten Oscar was cuddling up with me. l liked reading about Kate and heaven. They are 50 chapters. this is a awesome storyline l can not put in to words how great this book is l fell in love with the poems and quotes and song words. This book is in memorian of John Ballard of Nigeria, England, and Australia. l liked reading the authors note about her, her husband, their three daughters and their five grandchildren. About The Author: Ruth Finnegan, OBE, is a renowned scholar and celebrated writer who is emeritus professor, the open university, a fellow of the British academy, and an honorary fellow of somerville college oxford. She was born and reared in ulster and sent to a Quaker school filled with biblical texts and music, which are reflected in the novel. First-class oxford degrees in classics and philosophy were followed by African fieldwork, which Ruth describes as " totally inspiring for my life and work" She returned to oxford for a doctorate in anthropology before university teaching in Africa and briefly in Fiji, and finally the open university in the u.k. She has three wonderful daughters and five grandchildren, she lives with her husband and two cairn terriers in buckinghamshire.